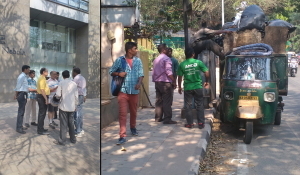 B.PAC Civic Leaders Take On Illegal banners in Sanjaynagar. 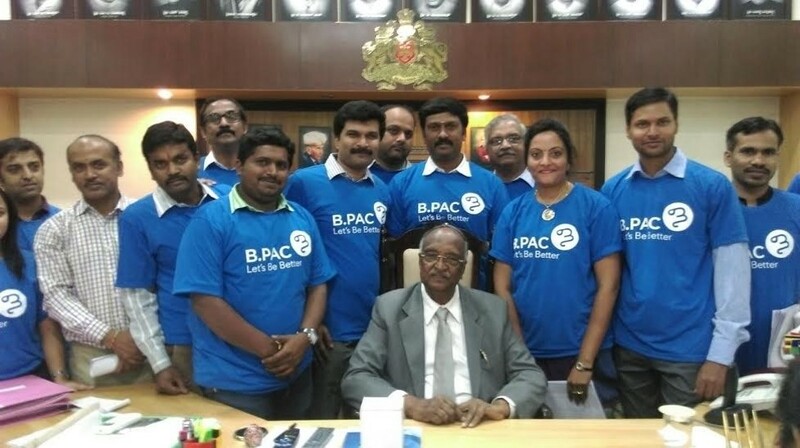 Bengaluru, August 1st 2016 : The B.PAC Civic Hub in Sanjaynagar run by Mrs. Geetha and Mr. Subaiah T.S is always abuzz with activity, with a multi-pronged approach to dealing with civic issues being implemented at all times. 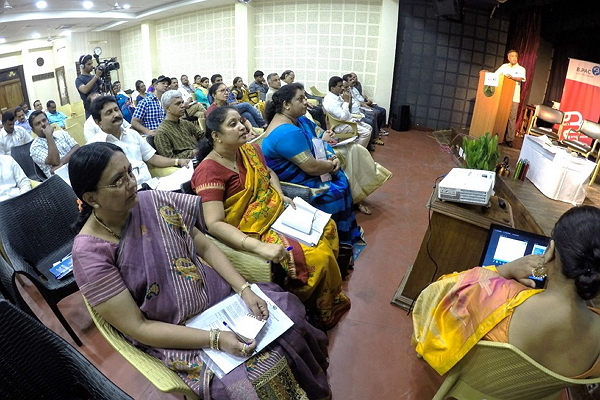 Bengaluru, July 16th 2016: Jayalakshmi, a member of the B.CLIP program, has helped more than 12,000 people avail the benefits of Yeshaswini scheme, which aims at providing cost effective quality health care for the poor. She also works extensively towards ensuring better quality of living for the poor in the city through the promotion of various other schemes. Bengaluru, August 31, 2016: Bangalore Political Action Committee (B.PAC) in association with Youth for Seva(YFS) and Unnathi Women Welfare Association organised a workshop teaching participants to make eco-friendly Ganesha Idols. 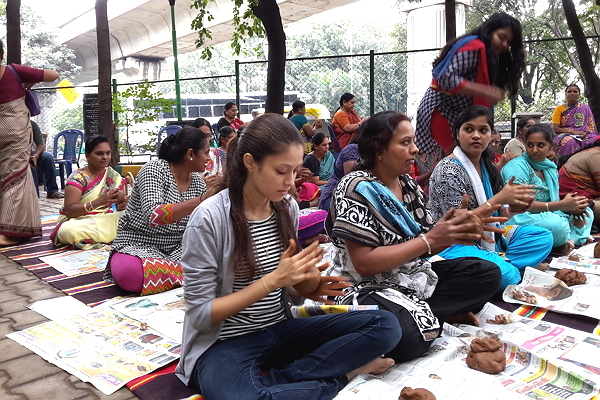 The workshop, which saw the participation of more than 80 women and youths from the city, taught the participants to make eco friendly Ganesha idols for the festival. Bengaluru, August 22, 2016: War On Dengue is a social project report done in Ward 119 (Dharmaraya temple ward) of Chickpet assembly.The campaign was spearheaded by Dr Satish Shendre, a member of the B.CLIP initiative, which began when there was a sudden increase of dengue cases in the area. There were more than 40 people with dengue symptoms, like fever, joint pains and general weakness. When the blood tests were done, the report showed decreased platelet counts and zero positives for the dengue virus. 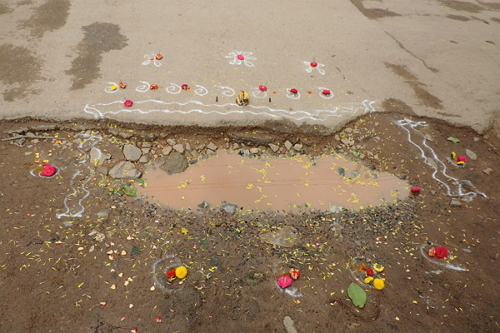 Bengaluru, 9th July: Led by Ms Kavitha Reddy, a civic leader and member of the B.CLIP initiative, the residents of Sector 1, HSR Layout performed a ‘Pothole Pooje’ on the 9th of July. It was done to highlight the number of potholes on the roads, and also to draw the attention of the Bruhat Bengaluru Mahanagara Palike (BBMP) towards civic apathy. 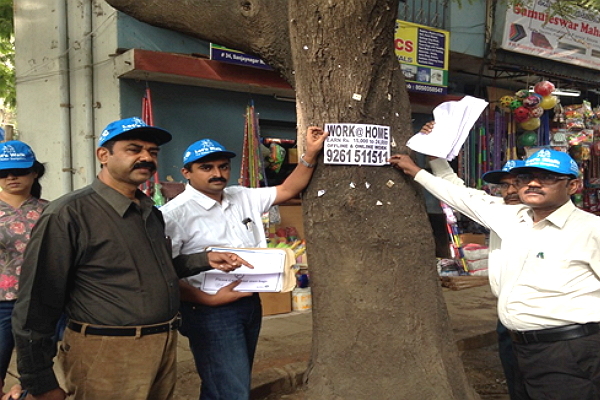 The residents, who tried to get the BBMP interested in many ways, finally resorted to this act. Late one night in July, a couple had just alighted from a flight from Hong Kong and were in the city before they would head home to Anantapur in Andhra Pradesh. They’d planned on hailing a bus from the city and had to cross the busy Kempapura-Hebbal junction in order to get to the bust stop. The man, luggage in tow, was a few feet ahead and on turning back received the shock of his life when he saw his wife lying still in the middle of the road. 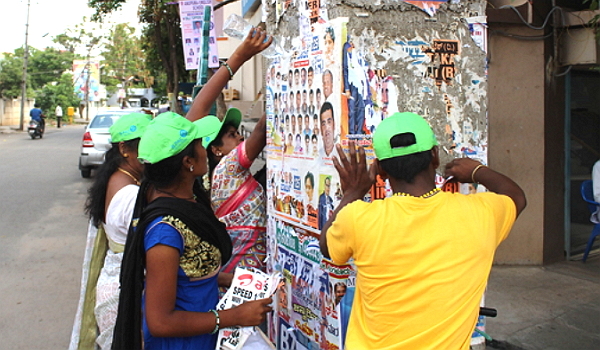 Bangalore, May 23, 2016: B.CLIP’s Civic Hub leader Jayalakshmi joined hands with the Resident Welfare Association of Nandini Layout in organizing #KillBills drive to get rid of the illegal flex boards, posters and banners that are creating ‘visual pollution’ in in the surroundings. This was conducted alongside with the campaign “Clean Nandini Layout, beautiful Nandini Layout” run by the corporator, K V Rajendra Kumar. Antony Das, is an active participant of the B.PAC Civic Leadership Incubator Program (B.CLIP) and also an advocate of civic issues. 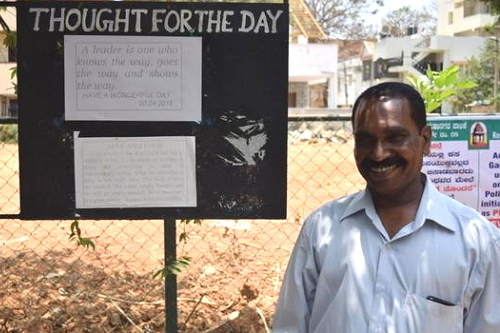 Das went on to take up numerous initiatives in his locality, specifically reviving a public park which was turned into a dump yard for several years. 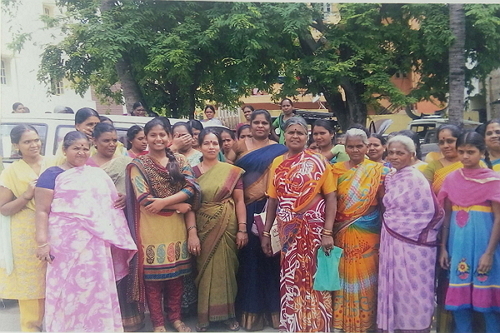 The initiative has seen some substantial progress after it was pushed forward to the local BBMP members by him. Originally a project of the BDA, in 2001, the park was transferred to the City Municipal Council (CMC) and later to BBMP. ‘May, 2016: B.PAC’s Civic Hub initiative has taken off to tackle the visual pollution in the form of illegal bills and hoardings have been plaguing the city for years now and the menace is increasing day by day. Billboards are put up for the most trivial and ignorable reasons. 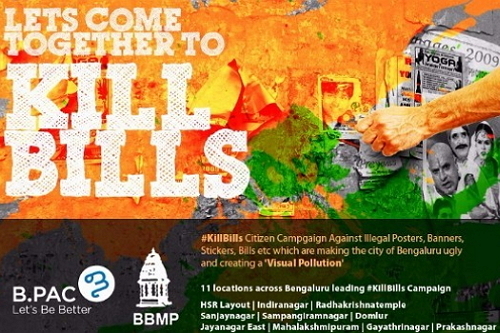 Civic Hub participants conceptualized a unique campaign called ‘KillBills’ which was an effort to get rid of the unsightly bills and flyers that have been pasted on public walls and trees. B.PAC launched Corporator Engagement Program (CEP) to focus on ward development and address the persistent local problems. CEP is intended to strengthen the engagement with Corporators through meaningful interventions and innovative solutions for various civic issues. B.PAC is proud to announce the launch of its B.CLIP Civic Hub initiative under which 10 such hubs will be set up across the city. 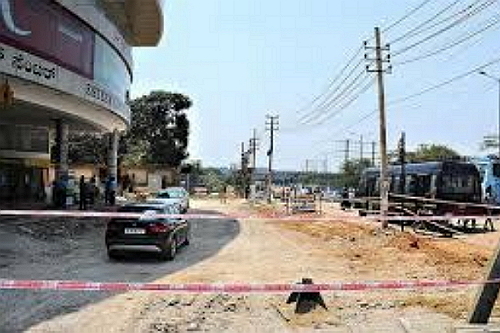 The first such hub was inaugurated in Sanjaynagar. 10 Participants who are actively engaged in their respective wards have been chosen by a rigorous selection criteria to lead these Civic Hubs. The participants were chosen based on their work on civic and community issues in the ward and their level of engagement with the political system. March, 2016: Corporators and Citizens have started to work hand in hand, thanks to B.CLIP’s Civic Hub initiative in Ward no 110. 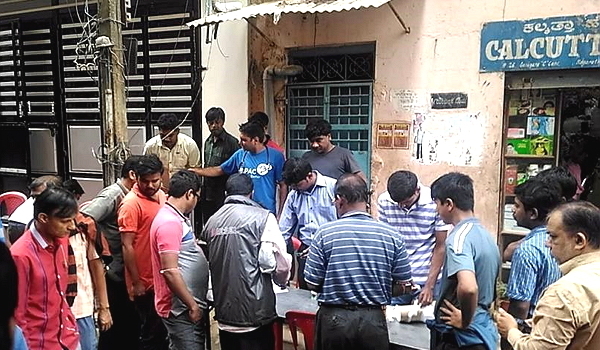 B.CLIP participant Sufiyan recently kickstarted his Civic Hub office in ward number 110 on Infantry road. Sufiyan has been a keen observer of the issues pertaining to his ward and has played an active role in helping improve his neighborhood. March, 2016: Ever since the garbage crisis broke out in Bengaluru, illegal dumping of waste has been a growing menace. The popular Infantry Road junction has now endured the wrath of garbage being unloaded illegally by nearby commercial complexes and residential buildings every week. The garbage dumped here has turned the prime Infantry Road junction into a black spot posing health hazards to residents of the area. 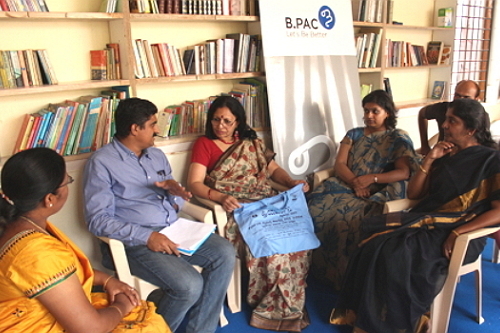 December, 2015: B.PAC, in association with the Bruhat Bengaluru Mahanagara Palike (BBMP) organized a workshop – Women Leaders for a Better Tomorrow – the imprint of women leader in political leadership. B.PAC noted the importance of commemorating the presence of 52 % women elected members in the BBMP council, a truly historic event in Bengaluru’s history. Smt. 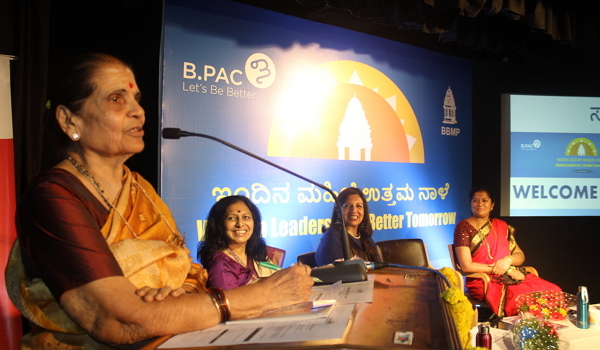 Leeladevi Prasad, one of first Corporators of the city of Bangalore, Speaks at the Event. .
November, 2015: The B.CLIP team attended the Council proceedings at Vidhana Soudha . The team had a first hand chance to witness the protest in the ‘well’ of the house. 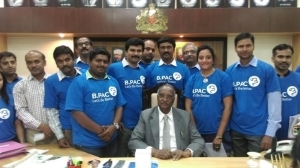 The team also had the pleasure to meet the Chairman Sri D. H Shankara Murthy at his desk, post the proceedings. He was happy to note the work that B.CLIP participants have taken up in their wards and invited them to attend more discussions. 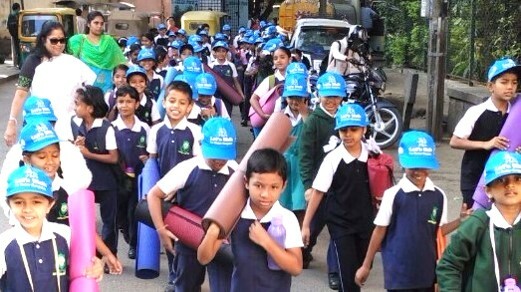 For the first time in the city, a one of a kind, Walk to School (W2S) program was conducted successfully by B.CLIP participants Subbiah and Geetha on Saturday in Sanjaynagar. This was supported by B.PAC and DULT ( Directorate of Urban Land Transport (DULT). Subbiah and Geetha, as part of Team CiFoS ( Citizens for Sustainability) executed this event in partnership with ESAF Bangalore. 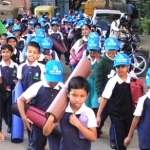 Bangalore Traffic Police (BTP) & BCOS also supported this initiative.